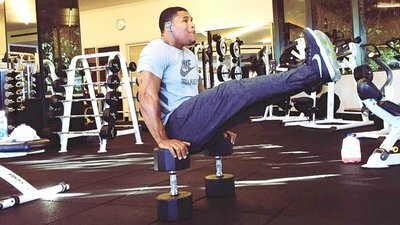 Learn the 5 simple rules trainer Ron "Boss" Everline uses to help comedy superstar Kevin Hart and other top Hollywood clients cut fat on the fly. When you fully dedicate yourself to the effort, getting lean can feel like a full-time job. After all, you can't simply spend an hour in the gym a few times a week and expect major results. You have to change several aspects of your lifestyle, from how and what you eat, to how often you work out, to how much time you give yourself for recovery. With all these adjustments, how can busy people like you and I—let alone the jet-setting celebrity crowd—find time to get fit? To learn more about successfully fitting fitness into even the most hectic lifestyles, we went to one of the busiest fit dudes we know: Los Angeles-based celebrity trainer and owner of Just Train, Ron "Boss" Everline. To keep up with his clients—including one of the biggest comedic movie stars in Hollywood today, Kevin Hart—Everline flies alongside them, which puts him almost constantly on the road. There, it's his job to meet the challenges posed by new digs every day and scouting out workout locations on the fly, while finding healthy food in hotels and on-set catering spreads. Here are some of the lessons Everline has learned about getting ripped on the go. Once you set your goals, your first priority is to clean up your diet, making smarter choices throughout the day. "To get lean, you need to focus more on increasing lean proteins in your diet while limiting sugar, amping up water intake to prevent dehydration and to help keep you feeling fuller between meals, and lowering your sodium by choosing foods with less salt," Everline says. Lifters aside, many people don't eat enough protein throughout the day. "You want to aim for 1 gram of lean protein per pound of body weight daily," suggests Everline. "For every one of your 5-6 meals each day, include some kind of lean protein, whether it's chicken breast, turkey breast, fish, eggs and egg whites, or a protein shake if that's what you have available." Everline doesn't make his clients count their macronutrients each day. "We travel so much, and while I make sure they eat a bit stricter, especially if they have to be ready for filming or a photo shoot, we have to do that without a stream of meal prepping and calorie counting," he explains. "The ultimate goal is to motivate people to live healthier and adopt good habits. You'll be able to maintain a lean body if you make many small changes and smarter choices." That means opting for an egg-white omelet instead of French toast, skipping the second helping, and drinking water instead of juice or soda, for instance. "Over time, you develop an eye for the right portion sizes. You're soon able to look at a piece of chicken and know if the portion size is too big or too small." "You frequently hear about the need to drink a gallon of water a day," Everline says. "While that's an amount to aim for, you're probably going to have to work your way up to that level over time." Everline recommends gradually building up your water intake over the course of a few weeks, to allow your body to adjust to absorbing more liquid." Let's say you drink four glasses on average—whatever size they may be—so to begin, just aim for six, then later eight, per day," he suggests. This advice, to be sure, comes with a warning. "During the first few weeks, you may find that you've gained some weight. That happens because your body hasn't yet learned how to adjust to the higher water intake," Everline says. "Over the course of a month or two, though, you'll start to better eliminate extra fluids and drop that water weight. You'll even get to the point where you're craving water instead of juices or other beverages you previously consumed." While a little more complex, Everline also suggests a carb-cycling system to many of his clients who are trying to drop body fat. "Again, I don't make anyone count macros, but we will manipulate carb intake from day to day," he says. "It's a way to get your body to tap into fat stores rather than incoming dietary carbs for energy." Everline times his clients' carb intake to coincide with higher-effort days and schedules lower-carb days in between. For instance, if you normally do a tough leg workout on Wednesdays, which involves a big muscle group, you'll do a high-carb day on Tuesday to prepare, then a low-carb day on Wednesday, followed by a nearly no-carb day on Thursday. On your low-carb days, reserve the majority of your carbs for your pre- and post-workout meals. "I aim for complex rather than simple carbs," says Everline. "We try to stick with brown rice, quinoa, multigrain bread, couscous, sweet potatoes, and green vegetables. We also include some healthy unsaturated fats every day, like almonds and avocados." No matter what, food choices are more about finding balance than outright restriction. "I don't complicate the diet," he says. "I just teach my clients to respect their diet as much as they do that hour they spend training in the gym. I find out which healthy foods they like and which ones they don't, and I don't make them eat foods they hate. So if they like sweet potatoes, cool—that's what we'll have. And if they start having too much of a single food item, I'll have them scale back. What I try to do is help them strike a balance." Fruit isn't off-limits either, since it's full of fiber and can help with sugar cravings. "I stick mostly to berries," Everline says. "I also tell clients that if they're craving sugar in the evening, they can eat fruit, but to limit their serving size as they get closer to bedtime." With less time than ever for whole-food meals, supplements have become an even more potent weapon for Everline to help keep his clients' nutritional goals on track. "I'm a fan of using amino acids with my clients," he says. "They're the building blocks of muscle, and they're helpful whether you're trying to get bigger or get lean. 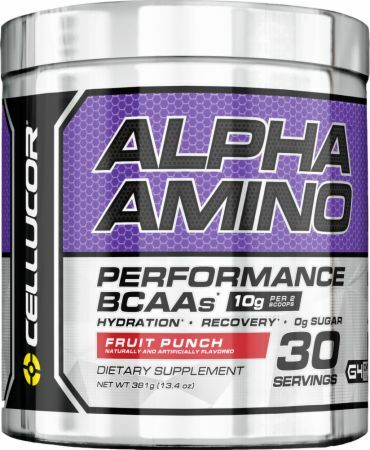 "I use Cellucor Alpha Amino before every workout. In addition to amino acids, it includes electrolytes (sodium and potassium) to help maintain key mineral balance and keep you hydrated during your workouts." Because of its fast digestion and high amino-acid content, Everline also recommends a post-workout whey protein shake like Cellucor COR-Performance. "Within 45 minutes of the end of my workout, I make sure to take in no fewer than 40 grams of protein, which is geared toward my body weight of 222 pounds." For smaller individuals, Everline recommends at least 25 grams of post-workout protein to maximize protein synthesis. As for training, Everline likes to cycle heavy and lighter weight-training weeks. "For the first week, we'll go heavier in our exercises, and for cardio we'll do 2-3 days of sprint intervals—for example, 20 minutes of one-minute sprints and one minute of recovery. In the next week, we'll go 15-20 reps during weight workouts, then back off on the intervals to maybe 30-second sprints, or introduce agility drills." By cycling workout intensity and choosing exercises that involve multiple muscle groups, such as dumbbell squat presses, lunge variations, and power cleans, Everline is hoping to create a body that's more than just show. "I like functional muscle—being ripped isn't the only goal. I also want people to have endurance and be able to handle the challenges of their daily lives." Throughout such a program, motivation matters. "My clients have to deal with an extra degree of scrutiny; once you become fit as a celebrity and lose weight, you're under a microscope if you slip back," Everline points out. "No matter who you are, it's about discovering what motivates you, what your individual goals are, and what you envision for your future self. It's not limited to your fitness goals—it's your goals in life." Part of that process is reminding clients that fitness is a long-term endeavor, and slip-ups happen. "You can mess up today, but doesn't mean you're starting over," he says. "Just because you didn't have a great Wednesday doesn't mean you start over on Monday. Instead, I say have a better Thursday. "As long as we make little improvements over time, that's what matters," Everline adds. "Motivation comes from a daily effort to want to be better. So if today isn't the best day, that doesn't mean tomorrow won't be. That's the attitude I try to get my clients to buy into: Your week doesn't start on Monday—your week starts every day."